Diazinon is a chemical compound that forms an ingredient of many pesticides. It is used in gardens, farms, and fields, to control a wide variety of insects and vermin. The compound is also used to protect pets against flea bites. Diazinon Poisoning is the accidental or intentional intake of any product containing the toxic compound. What are the Causes of Diazinon Poisoning? What are the Signs and Symptoms of Diazinon Poisoning? The signs and symptoms of Diazinon Poisoning can vary from one individual to another and depends upon the quantity consumed. It may be mild in some and severe in others. Several systems of the body, such as the digestive system, nervous system, vascular system, respiratory system, skin and ENT may be affected. How is First Aid administered for Diazinon Poisoning? Who should administer First Aid for Diazinon Poisoning? 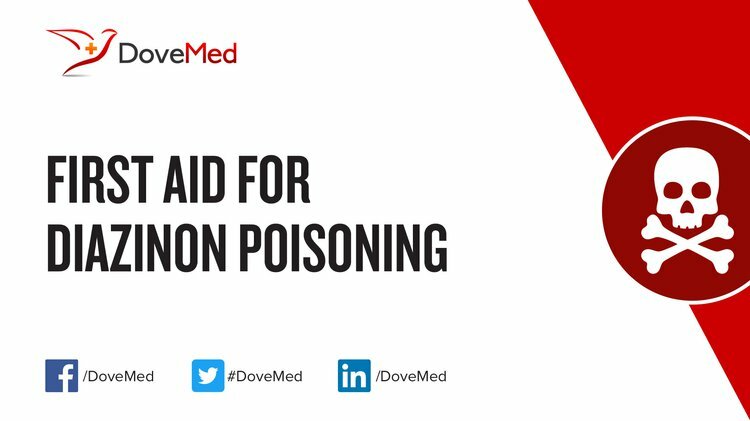 First aid for Diazinon Poisoning is administered by healthcare professionals. What is the Prognosis of Diazinon Poisoning? How can Diazinon Poisoning be Prevented? Swarnalatha, K., Rao, B. S. P., & Sonia, S. S. (2016). A study of serum psedocholinesterase levels following diazinon poisoning in relation to liver function-prognostic and therapeutic value. International Journal of Basic & Clinical Pharmacology, 5(5), 1937-1941. Vivisenco, C. I., & Ulmeanu, C. E. (2015, May). Cardiovascular findings in a prospective case series of fatal diazinon poisoning in children. In CLINICAL TOXICOLOGY (Vol. 53, No. 4, pp. 331-332). 52 VANDERBILT AVE, NEW YORK, NY 10017 USA: INFORMA HEALTHCARE. Someswar, G., Kumar, Y. R. N., Kumari, V. S., Gupta, A. V. G., & Prabhakar, R. R. (2015). Study of Clinical Profile of Organophosphate Compound Poisoning with Special Reference to Electrocardiographic Changes and Electrolyte Derangements. Indian Journal of Mednodent and Allied Sciences, 3(1). Govsavi, V., Shegokar, V. E., Bhelkar, S. M., & Tungikar, S. (2014). A Study of Profile of Patients with Organophosphorus Compound Poisoning at a Teaching Hospital. Konickx, L. A., Bingham, K., & Eddleston, M. (2014). Is oxygen required before atropine administration in organophosphorus or carbamate pesticide poisoning?–A cohort study. Clinical Toxicology, 52(5), 531-537. Dulaurent, S., Gaulier, J. M., Blanc-Lapierre, A., Imbert, L., & Lachâtre, G. (2013). Urinary determination of 2-isopropyl-4-methyl-6-hydroxypyrimidine in case of non fatal poisoning with diazinon. Forensic science international, 228(1), e20-e24. Pandey, S., & Pandey, S. (2014). KEYWORDS: Organophosphorus Compounds, Suicidal, Insecticide, Respiratory failure. PROFILE OF ORGANOPHOSPHORUS POISONING IN SOUTH EAST RAJASTHAN IN MEDICAL COLLEGE HOSPITAL, JHALAWAR, (390). Rao, A. P. N., & Lakshmi, S. (2016). Study of serial evaluation of serum cholinesterase level as a prognostic indicator in patients of organophosphorous poisoning. JOURNAL OF EVOLUTION OF MEDICAL AND DENTAL SCIENCES-JEMDS, 5(104), 7611-7615.